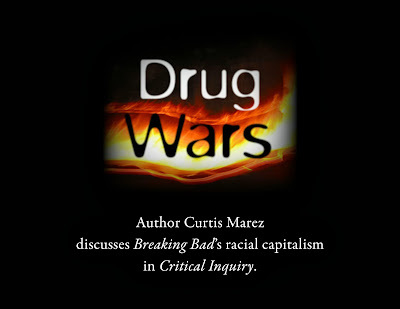 ... and other forms of racial capitalism in Breaking Bad, by Drug Wars author Curtis Marez writing for Critical Inquiry. In preparation for his showdown with Tuco and his posse, Walter shaves his head, making him resemble the Latino gangsters he confronts . . . For the remainder of the series Walter’s shaved head, combined with a goatee and a menacing gangster glare, would become the show’s most visible avatar. And while the shaved head/goatee combination is a fairly widely disseminated masculine style, I would argue that historically and particularly in films and TV shows about drug traffic, the look has been strongly associated with working-class men of color. such a great Post Thanks nice information.